I am so excited to bring you this thought-provoking conversation with naturalist and educator Erin Kenny, an international leader in the forest kindergarten movement and the founder of Cedarsong Nature School -- the very first US kindergarten based on the German waldkindergarten model. If you haven’t yet heard of waldkindergarten (or forest kindergarten, for that matter), it is very much as it sounds: an entirely outdoors-based early childhood education program which, in Cedarsong's case, goes on rain, snow, or shine on five acres of magical native forest on Vashon Island, a ferry's ride from Seattle. But forest kindergarten is also so much more: Here, Erin and I talk about the crisis of nature deprivation confronting today’s generation of children and parents; why this unique style of education is a compelling and desperately needed solution; and the remarkable learning that emerges from the deep nature immersion experienced at Cedarsong. Amazingly, forest kindergartens are only just taking off here in the US (despite having existed in Germany for more than half a century and where there are now more than 1,500 in existence), so if you're eager to join this burgeoning movement as a parent or an educator, don't miss Erin and this eye-opening episode! Where do the kids pee? You can learn more about Cedarsong Nature School on the school’s website. Erin’s book Forest Kindergartens: The Cedarsong Way, documentary DVD and teacher training packet -- along with the schedule of her upcoming teacher trainings and speaking tours -- are available at ErinKenny.com. 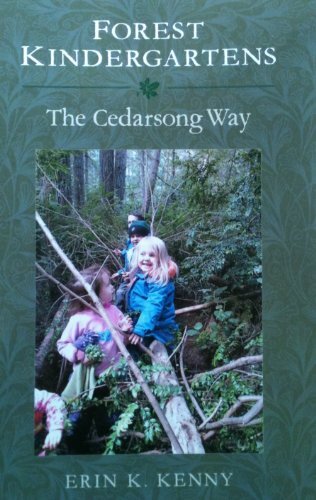 Cedarsong also has a wonderful Facebook page where you can check out photos and videos of the school in action. NYT: "Running Free in Germany's Outdoor Preschools"
NYT: "In Britain's Playgrounds, 'Bringing in Risk' to Build Resilience"